The Indian Embassy is organizing a dance event, BHARATANATYAM: Nokku – A view from the poem, which will take place on Friday 5th February 2016 at 18:00. The event will take place at the Embassy of India, Tiergarten Straße 17, Berlin. KarunaSagari Venkatachalam is a classical Bharatanatyam dancer trained by her mother. She was awarded an honours degree from Kalakshetra Foundation, Chennai in 2008. Venkatachalam received rigorous, in-depth instruction in bhakti spiritualism, poetics and performance from her grandmother, an esteemed scholar of classical and medieval Tamil literature. Karuna's talent has been recognised through many achievements, she has performed in many prestigious venues in India and abroad. She was also awarded with an Aikya Award in 2013, and presented with the title “Women defending our Culture” by Global Adjustments. She has been awarded with the Vasantalakshmi Narasimhachari Talent as well in 2011. Currently she is doing her Masters in South Asian Studies at the University of Heidleberg in Germany. Bharatanatyam is a form of Indian classical dance, which originated in the temples of Tamil Nadu. It is known for its grace, elegance, purity, tenderness, expression and sculpturesque poses. Nowadays it is one of the most popular and widely performed dance styles and it is practiced by both male and female dancers all over the world. Nevertheless it is more commonly performed by women. Nokku presents a set of poems, that cannot be expressed in verses alone, which are shaped themselves visually through Bharatanatyam. It adds various dimensions to the poems through interpretations and visualizations. With these, the poem becomes alive. It is also considered to be a fire dance, the mystic manifestation of the element of fire in the human body. There are five major styles, one for each element, that include Odissi (element of water), Kuchipudi (element of earth), Mohiniattam (element of air) and Kathakali (element of sky). 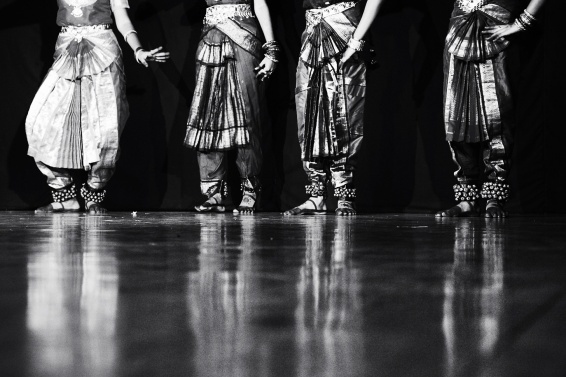 Bharatanatyam is usually a solo dance, with two aspects. The first one is lasya – the graceful feminine lines and movements, and the other one is tandaya – a masculine aspect.